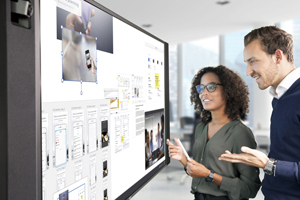 NEC Display Solutions has introduced a new collaboration tool that is intended to include everything needed to set up collaboration among multiple locations. Infinity Board includes hardware and software to "elevate" the interactive meeting experience. A passive stylus pen (it works by being in contact with the screen). Using the Mosaic software, the setup enables display-to-display connections as well as display-to-device and device-to-display interaction. Users can communicate with each other via video and share whiteboard content with connecting mobile devices for wireless transmission to the shared whiteboard. The system is available now with 55-inch, 75-inch and 86-inch screen sizes. A 65-inch format will be available early in 2019. For more information, visit the NEC site.